One of the most powerful worship experiences I have ever been part of was during a service at the Brooklyn Tabernacle in New York City. I've had the distinct privilege of being there both for a Sunday evening service and for the Tuesday night prayer meeting. Pastor Jim Cymbala has often stated that the Tuesday evening service throbs with the heartbeat of the church. The presence of God was so rich and sweet! That's saying something...coming from a Christian born and raised in the Plymouth Brethren assemblies or the brethren assemblies as we prefer to be known. 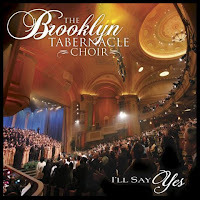 On this Easter week why not listen to the Brooklyn Tabernacle Choir as they triumphantly sing The Lamb Has Overcome. You will be moved! Believe me!